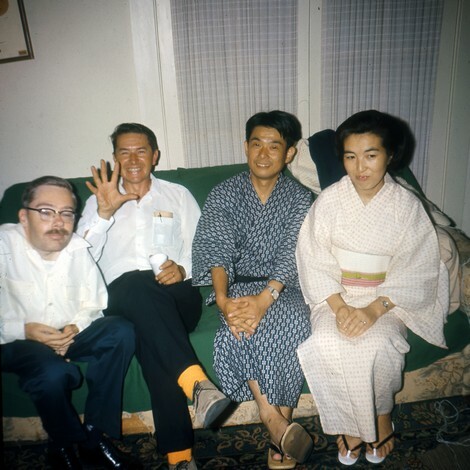 Rick Sneary, Roy Tackett, Takumi and Sachiko Shibano at the 1968 Worldcon, BayCon. Takumi Shibano died January 16 at 8:06 p.m. (JST). The reported cause of death was pneumonia. His life spanned the founding of Japanese fandom to the announcement of the Nippon 2017 bid. He was a guest of honor at two Worldcons, L.A.con III and Nippon 2007. Takumi, born in 1927, was the son of a Japanese Army officer. Following his father’s postings, Takumi attended schools in Taiwan, Tokyo and Manchuria. Upon finishing high school in 1945 he was drafted into the Physico-Chemical Research Association. There he learned the essentials of modern physics. After the end of WWII, Takumi attended the Tokyo Institute of Technology, graduating in 1950. That same year he sold his first story, which appeared under the name “Kozumi Rei” (a wordplay on “cosmic ray”). He would later use that pen name as a novelist and translator of science fiction stories. Takumi and Sachiko Takahashi married in 1954. They had two daughters, Miho and Minae. Takumi’s fascination with SF first drew him to join the UFOs Flying in Japan’s Skies Research Group in 1956. As he explained in a quote run in the Nippon 2007 Souvenir Book, “It wasn’t that I was so enamored of UFO research, but that I was interested in those basic, fantastical science ideas, so I wanted to do SF.” The group was as close as he could get, but that would soon change. At one of the meetings he threw out the idea of doing an extra issue of the group’s publication solely devoted to SF. Several members responded so enthusiastically they launched the first issue of Uchuujin (“space dust”) in May 1957. Uchuujin’s first issues were handwritten on mimeograph stencils, but it transformed into a typset publication by 1960. In later years, the zine’s best stories would be collected in five professionally published volumes. Production of the magazine soon led to in-person discussion and the formation of Kagaku Sosaku (variously translated as Science Fiction Club or Science Creation Club), led by Tetsu Yano. Takumi chaired four of the first six Japanese national science fiction conventions. He also helped establish the Federation of SF Fangroups of Japan in 1965 and served as chairman from 1966 until 1970. He wrote several original juvenile science fiction novels, all published in Japan under his pen name Rei Kozumi: Superhuman ‘Plus X’ (1969), Operation Moonjet (1969), and Revolt in North Pole City (1977). He was also the principal author of The World of Popular Literature (1978), a nonfiction work. Takumi was effectively introduced to American fans through the pages of Roy Tackett’s fanzine Dynatron. People became eager to meet him in person. LA’s bid committee for the 1968 Worldcon simultaneously ran a fan fund to bring Takumi Shibano to the Worldcon. Only the fan fund succeeded, consequently Shibano-san attended BayCon, the Worldcon in Berkeley, California. He and Sachiko attended many more Worldcons through the years. 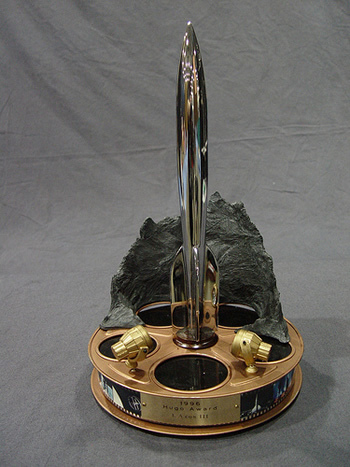 At Denvention 2 in 1981 they appeared on stage during the Hugo Awards for the first time to present Seiun Awards to the Western sf writers whose translated works had won. 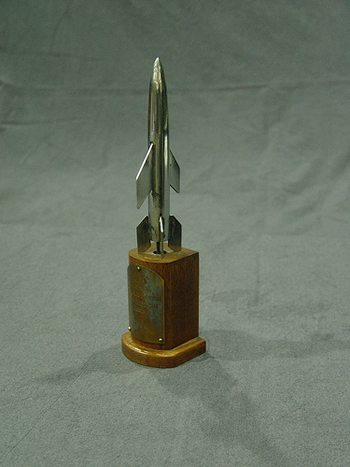 (The winners are chosen by the Japanese national convention.) It became a Hugo night tradition for the Shibanos or other Japanese pros to appear in ceremonial robes and recognize the winners. 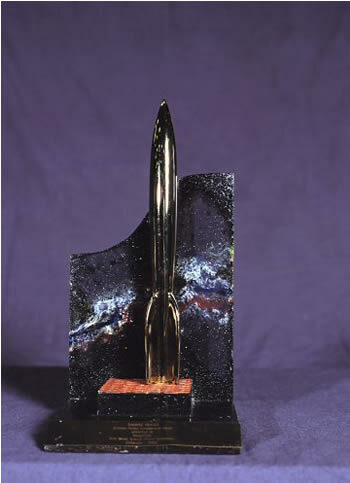 Takumi won World SF’s President’s Award in 1984 and its Karel Award in 1991. 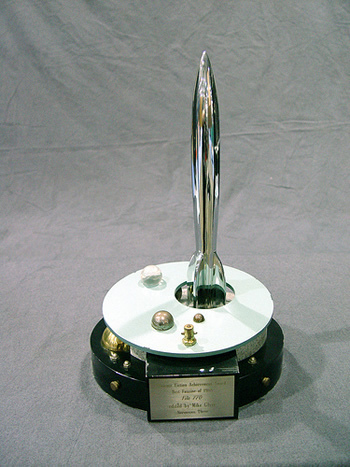 He received a Special Committee Award from ConFrancisco, the 1993 Worldcon. And he was the winner of the E. E. Evans Big Heart Award in 1987. Takumi, through his love of science fiction, achieved a rare bridging of cultures. He was a gracious man who warmly responded to anyone’s welcome and questions. Like Ackerman, to whom he is invariably compared, he was one of fandom’s early organizers who became an international ambassador of science fiction. Update 01/18/2010: Adopted correction by John Hertz — the proper order of Takumi’s pen name is “Kozumi Rei.” Then, based on Petrea Mitchell’s suggestion (and a consultation with John) altered the spelling of the fanzine title to ‘Uchuujin,’ as the most accurate translation within the power of my limited coding skills…. The John Hertz fan writing sample site has been updated by Chaz Boston Baden. One of the most impressive additions is “The Residence of the Wind” (Argentus #8), the second half of John’s Nippon 2007 report covering his adventures in Japan after the Worldcon. It’s the companion piece to “The Worldcon I Saw”, published in File 770 #152. News services throughout the world reported that a Thai fireman turned superhero when he dressed up as comic-book character Spider-Man to coax a frightened eight-year-old autistic boy from a third-story ledge. So when the chips were down, Ultraman got left in the locker and Spider-Man saved the day. 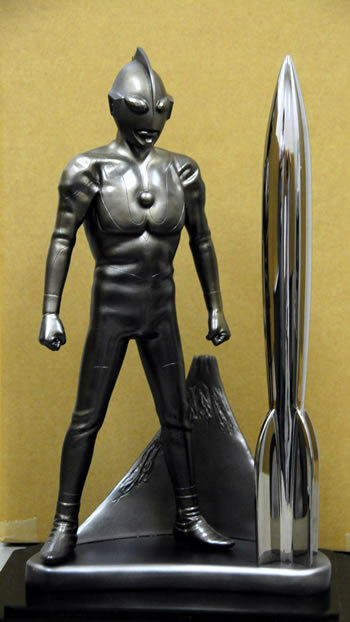 When an Ultraman statuette decorated the Nippon 2007 Hugo base I laughed about a hypothetical New York Worldcon following suit with a Spider-Man base. Now who knows, if Somtow Sucharitkul held a Thai Worldcon they might really do it. File 770’s 30th Anniversary issue is now available at eFanzines.com. Thanks to the indefatigable Bill Burns for taking time out from his Eastercon trip to post it. Here you can read John Hertz chronicling the Nippon 2007 Worldcon. There’s a classic photo of John Pomeranz in Japanese formal clothing next to George Takei at the Hugo ceremony. And Bruce Gillespie adds his salute to Big Heart Award winner Robin Johnson. Chris Garcia, Taral Wayne, Mark Leeper, Marie Rengstorff, James Bacon and Francis Hamit celebrate the anniversary with their own special features. Brad Foster’s cover on this issue is also his 71st contribution to File 770, going back to 1984. The PDF file contains information about how to subscribe to the paper edition, too.